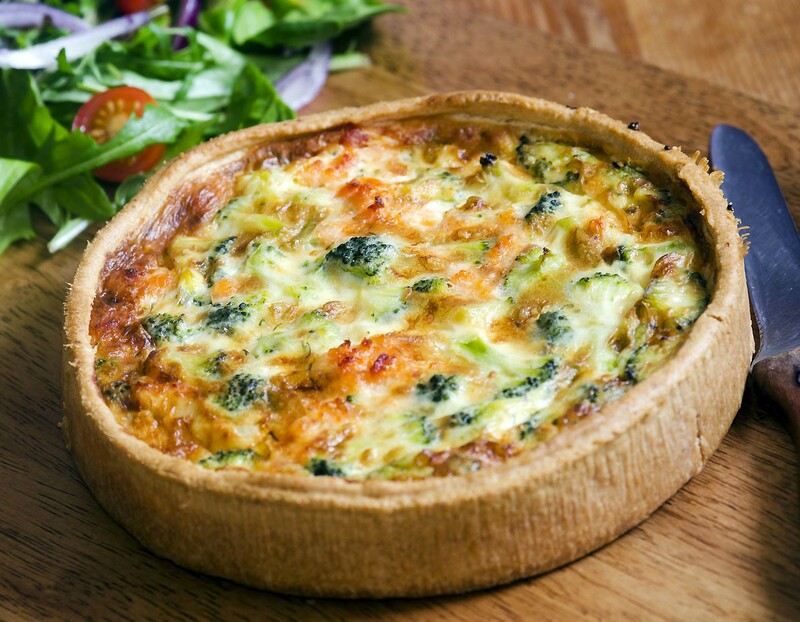 Quiche with broccoli and chicken - a diet recipe step by step! I ate quiche only a few times (always in a cafe: spinach, fish, with leek) and for some reason never thought that his house is a snap to prepare. And finally I decided - my first quiche with broccoli and chicken. Firstly, quiche - it is very tasty! Delicate shortbread dough and lots of toppings. Moreover, it can be anything: chicken or fish, spinach, broccoli, cheese, beans, onion, sorrel; In short, any vegetables and, of course, eggs and cheese, which is poured thick layer of filling. And French quiches like me because of the simple ingredients obtained quite a complete main course, beautiful, tasty, satisfying, and he was not ashamed of guests present - «wow-effect" is provided! And finally: diet quiche with broccoli and chicken is good as завтракAnd for lunch ... and even for dinner. *If you want, you can use 50: 50 with whole grain wheat. Cooking dough. Cottage cheese is good with egg whisk in a blender until smooth. Add flour, salt and knead the dough (a spoon, spatula or using a special mixer nozzle). First, the dough may seem a bit sticky, but after a couple minutes of flour will take all the excess moisture and swell, the dough will become the right consistency. Roll it on a floured surface, gently insert into the form (or, as an option, you can "roll out" the dough directly in the form of distributing fingers - as you prefer). Make bumpers of the test (higher), the extra pieces can be neatly trimmed. Put the form with the dough in a preheated oven 180 degree minute 7-10, so that it is slightly browned. Remove the form (as long as it is not required). Cooking stuffing. Chicken cut into small pieces and cook (10-15 minutes). You can also use a ready-made fillets - then simply crush it, in its sole discretion. Broccoli Boil 5-7 minutes in salted water. Cottage cheese, a pinch of salt and 1 egg whisk with a blender until smooth. Optionally, you can add the cottage cheese fresh herbs. The mass of cheese lay out on the basis of the test, on it - the chicken pieces, top layer - the broccoli. Right in the form of a little mix layers. 2 Whisk eggs (can be added to them just a little bit of milk) and grated cheese, add salt and favorite spices to taste. Pour this mixture quiche and put in the oven minutes with 20-30 180-200 degrees. Before you get quiche, you can sprinkle a little cheese and give it browned a couple of minutes. Quiche with broccoli and chicken is ready! Wait for cooling and then remove from the mold.